Toy Story Midway Mania Attraction at both Disney’s Hollywood Studios (in Toy Story Land, replacing the space formerly occupied by Who Wants to Be a Millionaire—Play It!) and Disney California Adventure (in the Pixar Pier area). For the first time, an attraction was designed and built at California and Florida parks simultaneously. 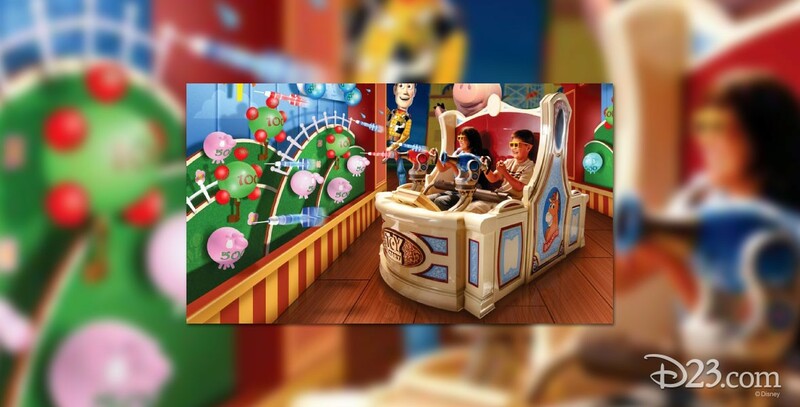 Guests wearing 3-D glasses ride themed vehicles along a route lined with “classic midway games of skill,” shooting toy cannons at animated targets. Various characters from Toy Story host the ride. The Disney’s Hollywood Studios attraction opened May 31, 2008, and the one at Disney California Adventure on June 17, 2008. The attraction is sometimes known as Toy Story Mania. Also at Tokyo DisneySea, opening July 9, 2012.